WASHINGTON DC – The U.S. Nigeria Council for Food Security, Trade and Investment (USNC), a business organization dedicated to deepening commercial ties between the U.S. and Nigeria and creating a platform for leading Nigerian entrepreneurs, hosted its annual executive spring dinner in Washington D.C. on Thursday, April 11. 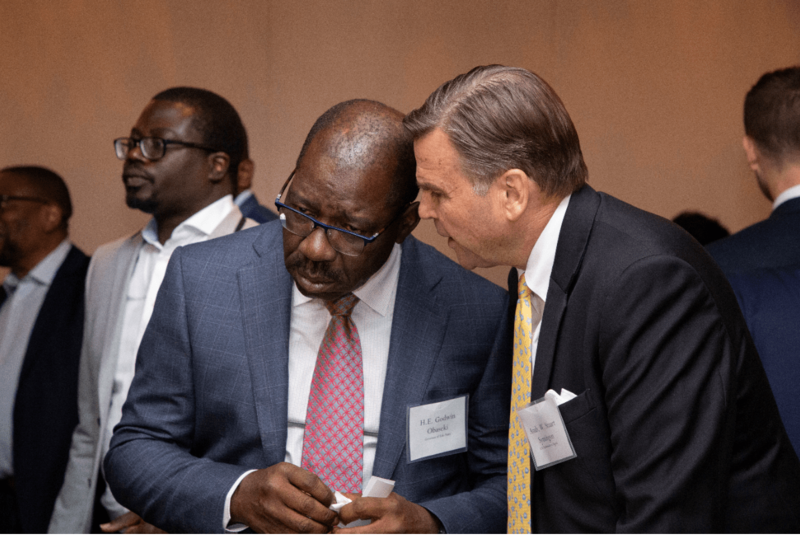 The Council’s first event since the Nigerian elections was held on the margins of the World Bank/IMF Spring Meetings and gathered over sixty leading Nigerian and American business executives and high-level public officials. USNC members present included Dr. ABC Orjiako of Seplat; Mamadou Beye of Chevron; Ambassador John Negroponte of McLarty Associates, and a representative from Ventures Platform. 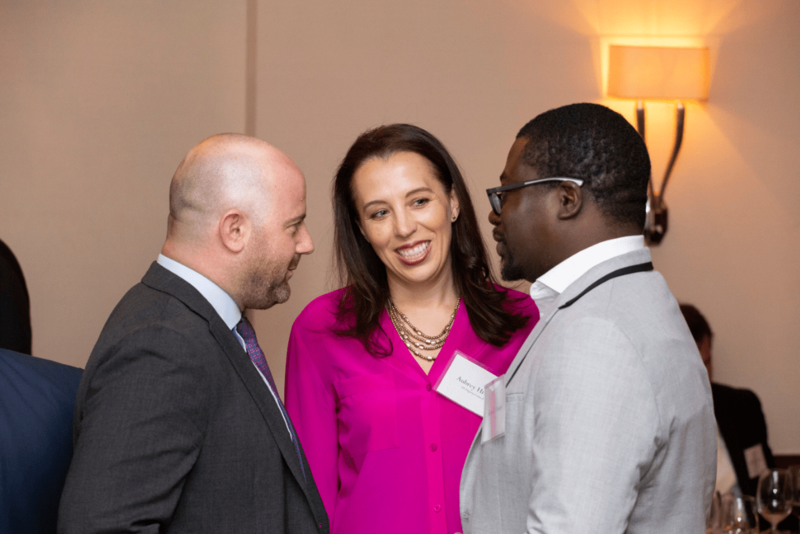 Other notable attendees included Kayode Pitan, CEO of Bank of Industry of Nigeria, Betrand Badre, Former Managing Director of the World Bank, Eme Essien, IFC Country Manager for Nigeria; and executives from Andela, Nithio, American Tower Corporation, and Lateral Capital. The Council will continue to convene business dinners in Washington DC, New York and Lagos. To learn more about USNC, please visit www.usnigeriacouncil.org or contact Talley Diggs at tdiggs@usnigeriacouncil.org. 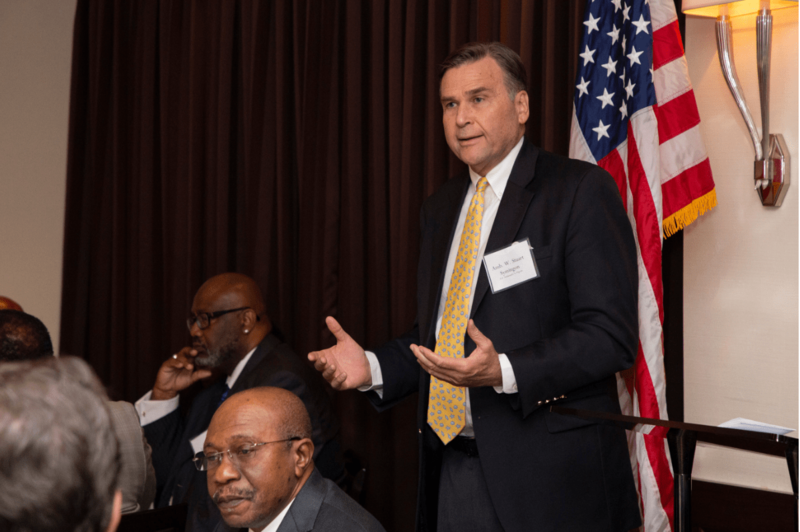 NEW YORK CITY – The US Nigeria Council (USNC), a business organization dedicated to deepening commercial ties between the US and Nigeria, hosted a roundtable breakfast in New York City on Tuesday, September 25th. 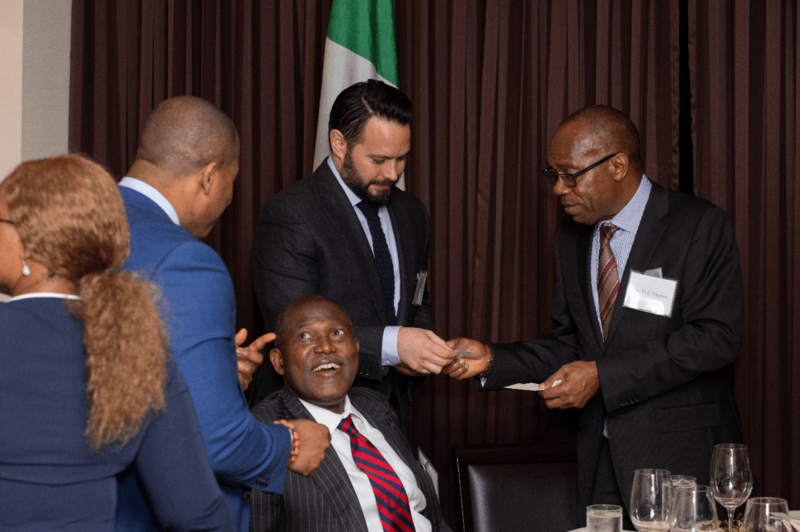 The event took place on the margins of the 73rd UN General Assembly and gathered over forty-five leading Nigerian and American business executives and high-level public officials. Further to USNC’s mission to promote bilateral business partnership and growth, the breakfast focused on entrepreneurial investment in the technology and innovation ecosystem. The commitment of USNC members was represented by the participation of Herbert Wigwe of Access Bank PLC; Wale Tinubu of Oando; Kola Aina of Ventures Platform; Tunde Folawiyo of Yinka Folawiyo Group; Ambassador John Negroponte of McLarty Associates; Christina Sass of Andela; Femi Akinware of Exchange Telecommunications Ltd; and Mamadou Beye of Chevron. Throughout the breakfast, members from various sectors shared updates, such as Ventures Platform’s remarks on its recently announced Corporate Leaders Fund that aims to increase market access by investing in start-ups. Other notable attendees included Kayode Pitan, CEO of Bank of Industry of Nigeria; Yewande Sadiku, Executive Secretary of the Nigerian Investment Promotion Commission; Nigerian NBA star Festus Ezeli and executives from Renaissance Capital, Lateral Capital, Bechtel International Inc., Zephyr Management, and Lori Systems. 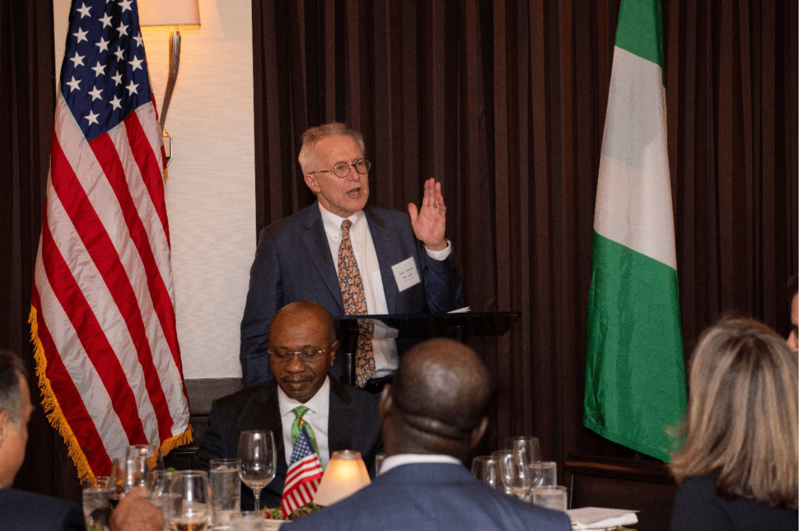 Washington DC, April 19, 2018 — The US Nigeria Council (USNC), a business organization dedicated to deepening commercial ties between the US and Nigeria, held its annual Spring reception and members-dinner on the margin of the World Bank-IMF meetings in Washington DC. As part of the event, the Council introduced its new chairman, Terence McCulley, former US Ambassador to Nigeria. 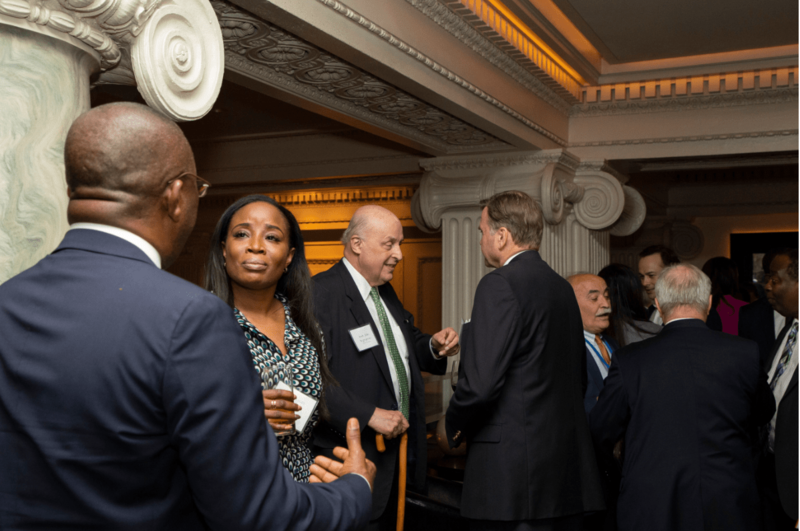 The Council reception had over 100 US and Nigerian senior executives in attendance. Nigerian Ambassador Sylvanus Nsofor participated in the reception and pledged embassy support for USNC efforts. In his opening remarks, the Executive Director of the Council, Eliot Pence, said that the Council was founded to act as a convener, clearinghouse and catalyst for business and investment opportunities for US and Nigerian firms. He added that the reception and dinner was the fourth of its kind following successful dinners and receptions in Washington DC, New York and Lagos since its inception in 2016. Speaking at the reception, Council Chairman, Ambassador McCulley, said that the US Nigeria Council “is the only group focused solely on facilitating US-Nigerian joint ventures and partnerships, and it has succeeded in meeting its goals, with deals emerging from every reception and dinner it has hosted.” He added that council is currently working with the Nigerian Ministry of Trade and Investment on industrialization efforts and have been helping one of its members, Zipline, advance its innovative project in Nigeria to deliver blood and essential medication via drones. The reception was immediately followed by a business dinner targeted at driving deals and fostering stronger relationships between businesses. The Co-Chair of the council and Chairman of Flour Mills Nigeria, John Coumantaros, appreciated the presence of senior business executives at the dinner. He noted that the US Nigeria Council is laser-focused on deepening the US-Nigeria commercial partnerships at a critical time. “At these dinners, we seek to uncover areas of shared interest and pave the way toward joint ventures, partnerships and diversified investments. USNC has supported entrepreneurs in Nigeria to grow. Tomato Jos, for example, has received additional investment that enabled the company to invest in irrigation, additional land and access the full range of support and expertise from agribusinesses like Flour Mills of Nigeria, but also other member companies” added John Coumantaros. In his closing remarks, Ambassador McCulley noted that in five years, the Council can look back and say that the partnerships and relationships formed between U.S. and Nigerian members significantly and measurably contributed to Nigeria’s development, economic diversification, and job creation. He acknowledged founding members: Dangote Group, Oando, Access Bank, Zenith Bank, Chevron and the Nigerian Sovereign Investment Authority and the young entrepreneurs who attended the reception and dinner. The USNC is the go-to C-suite access point for large-scale US and Nigerian investors seeking opportunities for joint ventures and catalytic partnerships. The Council membership includes leading organizations such as Chevron, Dangote Group, Nigerian Sovereign Investment Authority, Flour Mills of Nigeria, McLarty Associates, Zenith Bank, Andela, Access Bank, Oando, Yinka Folawiyo Group and Seplat. To learn more about USNC, please visit www.usnigeriacouncil.org. Washington DC, January 16, 2018 — The United States Nigeria Council (USNC), a business organization dedicated to deepening commercial ties between the US and Nigeria, announced the appointment of Ambassador Terence McCulley as its new Chairman. Ambassador McCulley served as US ambassador to Nigeria from 2010 to 2013. The US-Nigeria Council, launched in 2016, acts as a convener, clearinghouse and catalyst for business and investment opportunities for US and Nigerian firms. 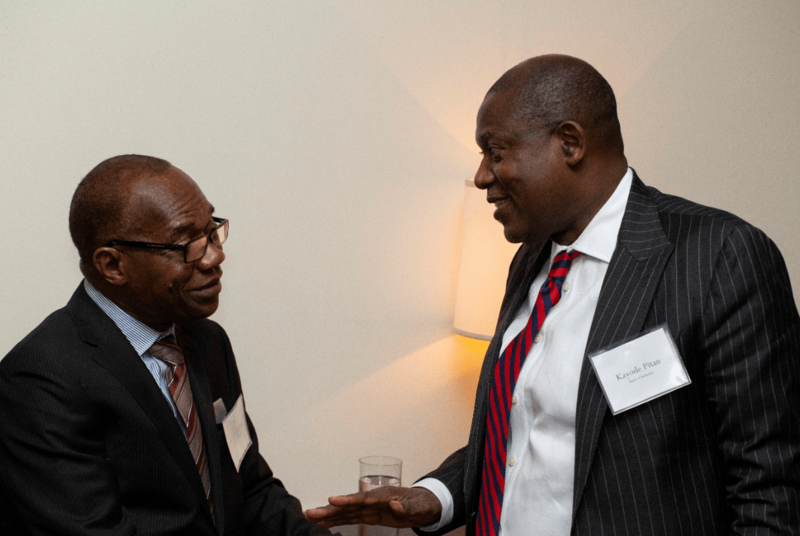 From its offices in Washington, DC and Lagos, USNC develops targeted partnerships between members with an aim to catalyze a new wave of diversified investment and inclusive growth. In addition to its continued work in agricultural supply chain development, the Council will focus on the ICT sector in 2018. 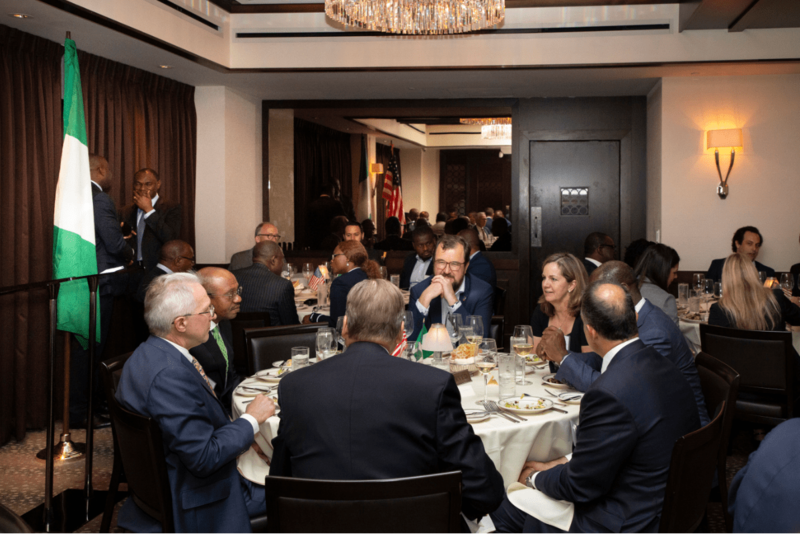 The US Nigeria Council (USNC) convened a dinner with the top US investors with interest in Nigeria in New York on Wednesday, 20th of September 2017 on the margins of the UN General Assembly. 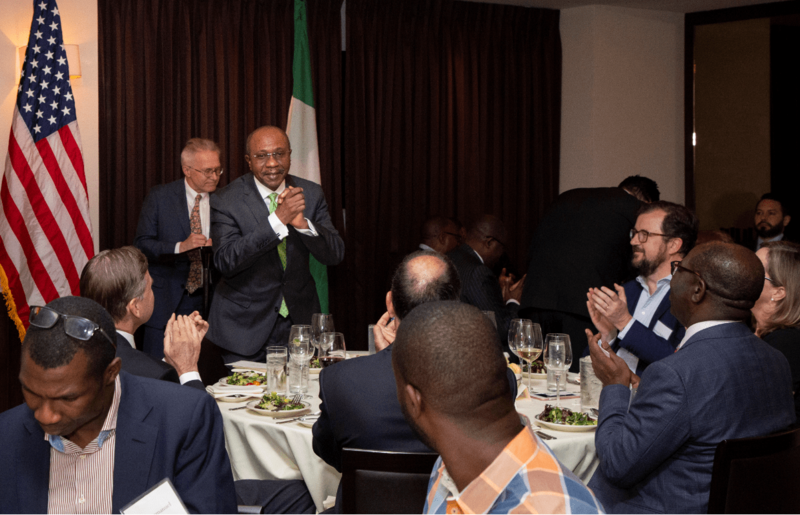 The dinner, co-hosted by John Coumantaros, Chairman of Flour Mills Nigeria Plc, Uche Orji, Chief Executive Officer of the Nigeria Sovereign Investment Authority, and Ambassador John Negroponte, Vice-Chairman of McLarty Associates, gathered leaders of Nigerian and American businesses. Council members and dinner participants focused on the need to create a competitive ICT cluster that will further develop the digital economy in Nigeria. US businesses attending the dinner included Google, Walmart, IBM, Tetra Tech, and American Tower. Among the leading investors at the event were Citi, Denham Capital, Fairfax Africa, CRE Ventures, Development Partners International, Atlas Mara and Zephyr Management. The commitment of Nigerian businesses to the USNC was demonstrated by the active participation of Jim Ovia of Zenith Bank, Adewale Tinubu of Oando, Tunde Folawiyo of Yinka Folawiyo Group, Abdulrazaq Isa of Waltersmith, Kola Karim of Shoreline Energy, and Oscar Onyema of the Nigeria Stock Exchange. The dinner welcomed a diverse group of entrepreneurs who have started companies in technology, agribusiness, e-commerce and education, including Cars45, Royal Power, GidiMobile, Flutterwave, RxAll, and Lidya. 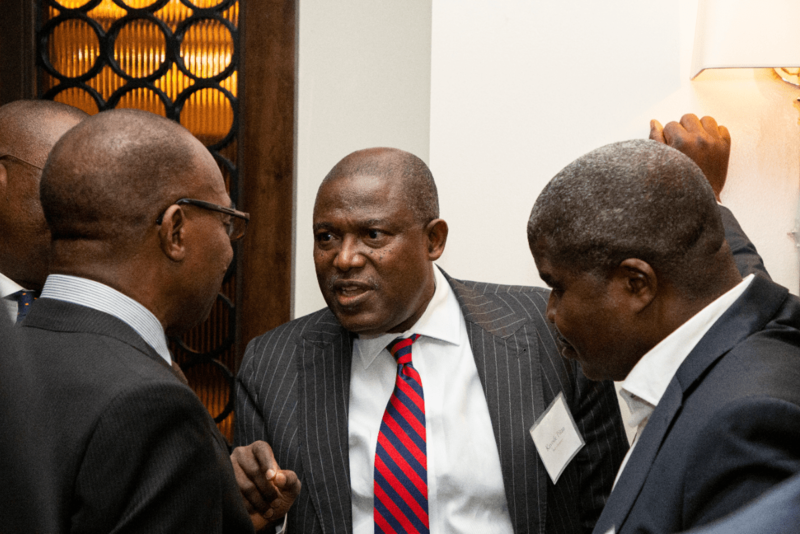 Convening leading Nigerian and American businesses, the U.S. Nigeria Council held an intimate breakfast briefing and discussion in Lagos in July 2017. 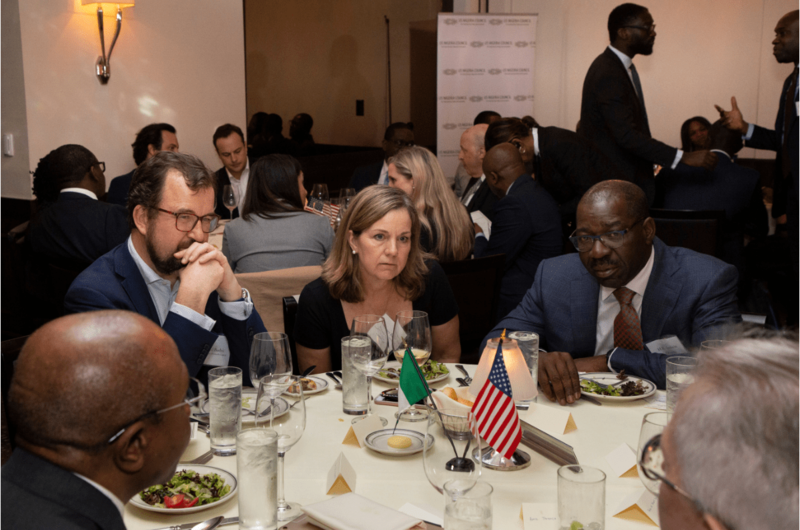 Hosted by Eliot Pence, Executive Director of USNC, and Aubrey Hruby, Senior Fellow of the Atlantic Council, the event was attended by the leadership of Nigeria’s largest companies and major US investors. Council members received an exclusive briefing by a top level official from the US Embassy on the state of US-Nigeria Commercial Dialogue. US and Nigerian business commitments were representative through the active participation of high level delegations, including from Dangote, Oando, Zenith Capital, Google, Oracle, Accenture, Dow, Caryle, KPMG, Deloitte, Monsanto, LASB, Dufil, 7UP, ANAP Jets, Westron Group, Verod, Greenwish Partners, and Nigerian government officials. The Council’s breakfast was also attended by young entrepreneurs who have started companies in technology, agribusiness, e-commerce and education, such as Tomato Jos and Andela. Convening leading Nigerian and American businesses, the U.S. Nigeria Council held its Nigerian launch in Lagos in March 2017. Hosted by John Coumantaros, Chairman of Flour Mills Nigeria Plc (FMN) and Nigeria Sovereign Investment Authority (NSIA) CEO, Uche Orji, the launch dinner was attended by the US Ambassador to Nigeria Stuart Symington, the Central Bank Governor, Godwin Emefiele, the US Counsel General John Bray and the leadership of Nigeria’s largest companies and major US investors. The Nigerian business commitment to USNC was represented by the active participation of Alhaji Aliko Dangote of Dangote Group, Oba Oteduko of Honeywell Group, Jim Ovia of Zenith Bank Plc, Herbert Wigwe of Access Bank Plc, Akinsowon Dawodu of Citibank Nigeria, Adewale Tinubu of Oando, Aigboje Aig-Imoukhuede of WAPIC, and Abdulsamad Rabiu of BUA Group amongst others. The Dow Chemical Company, Chevron, UPS, Procter&Gamble, ExxonMobil and Uber were some of the US businesses that sent senior delegations. The Council also includes young entrepreneurs who have started companies in technology, agribusiness, e-commerce and education, including Tomato Jos, Mall for Africa and Andela. The U.S. Nigeria Council welcomed high-level private and public sector representatives for a reception and dinner on April 14, 2016. With remarks from Linda Thomas-Greenfield, Assistant Secretary of State and the Council Co-Chairs. Guests were introduced to USNC’s vision and objectives. The US-Nigeria Council acts as a C-suite Convener, Clearinghouse and Catalyst for U.S. and Nigerian companies. Learn more about the council by contacting info@usnigeriacouncil.org.